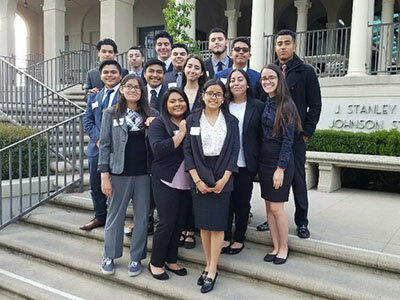 Occidental College's Upward Bound program has been awarded a five-year, $2.68-million grant by the U.S. Department of Education. The federal program helps motivated low-income high school students and students who would be the first in their families to attend college reach their academic potential and complete a postsecondary degree. In June, all 21 of Occidental's Upward Bound seniors will graduate from high school. Next fall, they will attend Carnegie Mellon, UC Santa Barbara, Mills College, Cal State Northridge and Los Angeles City College, among other colleges and universities. Oxy's program welcomed its first students in 1966, and is one of the oldest Upward Bound programs in the country. It serves about 122 local students a year—more than 2,000 students since its inception. In the last 25 years, 94 percent of participants have graduated from high school and enrolled in college. Since Occidental’s last five-year award in 2012, at least 82 percent of Oxy's Upward Bound students have stayed in college beyond a second year. "We are excited to continue to provide important services to students in our community," says Jesus Maldonado, director of Occidental’s Upward Bound program. "I have seen firsthand the impact UB services have on the success of our students. The data shows that the program works—it helps students graduate from high school, enroll in college and successfully earn a postsecondary degree." All of Oxy's Upward Bound participants would be the first in their families to attend college, and almost 90 percent are both first-generation and low-income. Their socioeconomic status reflects the student populations of their Los Angeles-area public high schools: Franklin, Lincoln, Wilson and Belmont. Oxy Upward Bound is a year-round program that provides academic instruction on Saturdays during the school year. In the summer, participants live for five weeks on the Occidental campus and take rigorous courses in mathematics, English, science, social science and foreign language. The courses are taught by certified teachers—some of them former Upward Bound participants themselves. The goals of the program are to develop key skill sets that positively impact academic performance in high school; expose students to the demands of college and guide them through the college experience; ensure that Upward Bound scholars graduate from high school with a solid postsecondary plan—both academic and financial; and to graduate students from a four-year college or university in six years or less. The Upward Bound program began as part of President Lyndon B. Johnson's "war on poverty," and is one of several related programs created by the Educational Opportunity Act of 1964. It was transferred to the Department of Education four years later. For more information on Occidental’s participation in the program, please click here.